Alex Williams (right) trains younger cadets to sky-dive. Williams started at the Air Force Academy at what he calls "the young but old age of 20" after serving in an Air Force honor guard for two years. Monica Callan (right) marches with first-year cadets. Callan has seven years on these 18-year-old cadets, who have nicknamed her "Mom-ica" and who she calls "my kids." 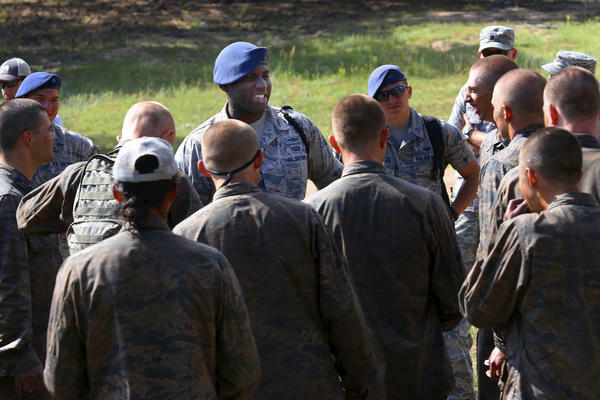 The pristine campus of the U.S. Air Force Academy just north of Colorado Springs, Colo.
Brian Kelly (center) chats with younger cadets who just endured the Air Force Academy assault course. A former air-traffic controller, Kelly is now the oldest cadet at the Air Force Academy. When he arrived, he says, he and other older cadets would wonder, "What are we doing here? We were 22 or 23, had a house, had a car, had a dog." As their final test, the cadets from C Flight crawled with their rifles in hand, under barbed wire through the white sand. Clumps of it stuck to the sweat and mud on their clothes and skin, drawing quips from some upperclassmen that they resembled sugar cookies. "Good job, Charlie Flight," Callan said as each cadet finished the course and rinsed off under a hose. "You're definitely dirty enough." Then she lined them up for the trek back to their camp through this pine-scented valley in the Rocky Mountains for fresh uniforms and showers. "Flight, by my command ... forward, march!" There's another thing besides the clean uniform that makes Callan stand out among these cadets: She's several years older than they are. She's not a member of the faculty, however. She's not an officer. Callan is a cadet herself, just beginning her final year at the age of 25. She's one of a growing number of academy cadets who are starting their higher educations later in life. 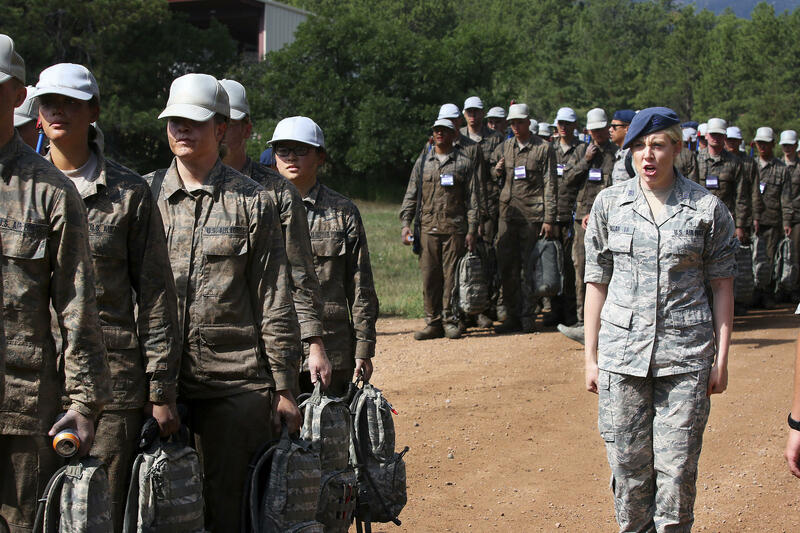 About one in 10 of the students entering the Air Force Academy this year is older than the traditional age, the academy reports. That's up from about one in 12 four years ago. Often, as in Callan's case, they're arriving here after years of military service — a vastly different experience than an 18-year-old straight out of high school. "These were kids who just before had gone every day from school maybe to practice, and then somebody made them dinner," said Callan. "They would stress out about the little things, like, 'Oh, somebody doesn't like me.' I've lived life a bit more than them." Early on, her classmates nicknamed her, "Mom-ica." Today, she calls these first-years "my kids." It's an unusual example of a broader trend in higher education: The proportion of students who are over 24 has increased from 28 percent in 1970 to about 42 percent today, according to the U.S. Department of Education. The experiences of Callan and her fellow "priors" — Academy lingo for cadets with prior military service — mirror those of older students at civilian universities. Callan spent a few semesters at Saint Joseph's University in Philadelphia and two years in the Air Force as a pharmacy technician before enrolling here. That experience quickly put her ahead of the other cadets, and she found herself constantly making excuses to her flight commander as her slower peers struggled with skills she'd already learned. "Sir, I'm waiting on my classmates. Sir, I'm waiting on my classmates," Callan remembers repeating. But in the classroom, at this extremely competitive school, things were different. Fewer than one in eight applicants to the academy get in, making it more selective than Georgetown and the University of Southern California. Callan was rusty, and ended up on academic probation in the first semester. "I was, like, 'Why don't I remember what valence electrons are?' "
Once an afterthought, students over 24 have become a critical market for colleges and universities as they struggle to fill seats. Enrollment has fallen overall for the last five years, in part due to a dip in the number of 18- to 24-year-olds, the National Student Clearinghouse reports. Institutions "are in financial peril if they don't attract more students, which means looking at nontraditionals," said Joe Garcia, who heads the Western Interstate Commission for Higher Education consortium. "And that's the same in every state." Older students are also needed to help meet a national goal set under the Obama administration of increasing the proportion of the population with degrees to 60 percent by 2025. Progress has been slow, and today the figure stands at less than 46 percent, according to the Lumina Foundation, which tracks it. (Lumina is among the funders of The Hechinger Report, which produced this story.) Forty states have set their own targets. "The math just does not add up if we rely only on 18-year-olds," said Emily House, an assistant executive director with the Higher Education Commission in Tennessee, which next fall will extend its pioneering free community college policy to students over 24. Some 34 million Americans who are 25 and older, or roughly one in six, started college but left before racking up enough credits for degrees, the last Census in 2010 found. That makes them prime candidates to go back and finish. 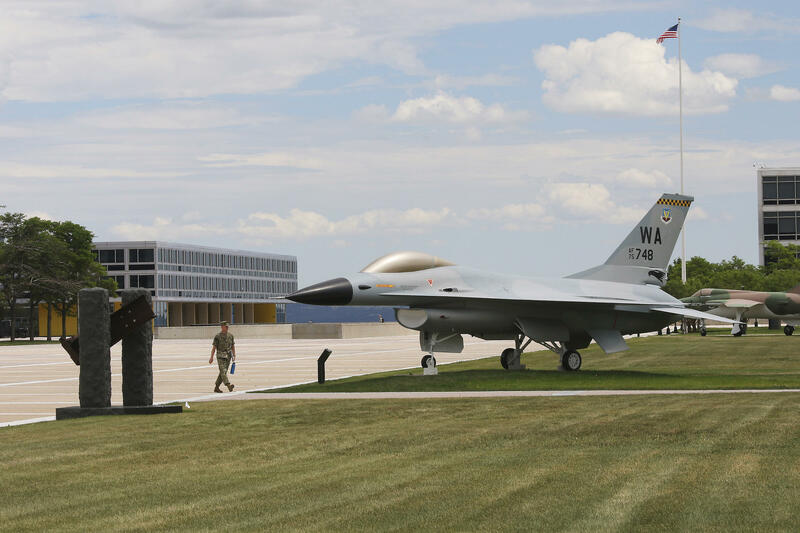 "This is where higher education is going," said Lt. Gen. Michelle Johnson, who stepped down in August after four years as superintendent of the Air Force Academy. Under her watch, the proportion of older-than-traditional-age cadets increased. There's another reason she encouraged this: Students who have lived outside of school bring new perspective to their younger classmates. "We want to get that experience and grit into what we do," she said. But other states and institutions, and the federal government, offer little such encouragement for older students. "Our systems have not evolved and adapted to this new demographic very well," Garcia said. "Most institutions would still rather somebody else serve those students so they can continue to serve the full-time traditional-age students, because that's what they're used to." To qualify for federal financial aid, for instance, students generally have to take at least two courses a semester, which is especially tough for working adults with families. They're not eligible at all for many state financial aid programs. Many colleges won't accept transfer credits that date back years. And the proportion offering on-campus childcare has declined, the Institute for Women's Policy Research reports, to fewer than half of four-year universities and 44 percent of community colleges. That's to say nothing of administrative offices that are open only on weekdays during business hours when many adult students are at work, or tutoring that's not available at night or on weekends. Older students often "don't feel like they're a part of or belong to the institution that they go to," said Antonio Quarterman, director of the McCarl Center for Nontraditional Student Success at the University of Pittsburgh. The campus is one of few with an office just for older students. The center stays open late and, this fall, will begin offering 24-hour tutoring online. Military veterans make up a sizeable number of the older adults going back to school. But only 30 percent told a Gallup survey they feel strongly that their colleges or universities understand their needs. Among all nontraditional-age graduates, only 14 percent feel connected to their schools, another Gallup poll found. Older students are also more likely to drop out. Nearly half quit before their second year, the National Student Clearinghouse says, compared with about 22 percent of students 20 and under. And an improving economy means more older students have been opting for jobs over classrooms. So just when policymakers want to see the long-term trend accelerate, it's started to slow down. The number of students over 24 in college fell by 3.6 percent in the spring, compared with the previous spring, the Clearinghouse reports. Like Tennessee, some states and institutions are working to reverse this. For example, Indiana's program, called "You Can. Go Back.," is targeting 750,000 residents who started, but haven't finished, their degrees. The University of Arkansas System is reaching out with emails and text messages to 100,000 students who went to its universities and community colleges over the last seven years but never finished. "So many people in the adult market simply gave up on the dream," said Michael Moore, the system's vice president for academic affairs. "They had these bad experiences with higher education and they think, 'Here's somebody else trying to pitch me to go back to school.' It takes multiple attempts to cut through the fog of, 'I can't do this anymore.' "
That's how Brian Kelly felt after two days at the Air Force Academy. He came here after 3 1/2 years on active duty as an air-traffic controller. "What are we doing here?" Kelly remembered thinking, along with his fellow priors. Before enrolling, "We were 22 or 23, had a house, had a car, had a dog." He's now entering his final year, and at 26 he's the oldest cadet. He knows that, unlike him, many older students in the civilian world also juggle families and jobs. "I can't fathom how I would deal with that," he said. Alex Williams became a cadet at "the young but old age of 20," after serving for two years as an Air Force honor guard in Washington, D.C. — including in front of foreign dignitaries and as a pallbearer at military funerals. Suddenly "cadets right out of high school were ordering me around," he recalled while on a break from his role as a sky-diving instructor at the academy airfield. "I'm like Grandpa in my squadron," said Williams, who has made nearly 540 jumps himself. It took Josh Renick a while to figure out that he was destined for the Air Force Academy. He worked in a movie theater and a pharmacy, as a roadie in a band, and started a degree in film and TV at a university in Texas. Then, after accompanying a friend to a recruiting office and spontaneously enlisting, he handled munitions at an Air Force base in Italy. "I just come with a different perspective from having lived life," said Renick. He's now entering his final year at 25. His younger classmates "don't understand how lucky they are," he said. "They are still figuring it out at 18." Copyright 2017 The Hechinger Report. To see more, visit The Hechinger Report. Back-to-school season is approaching, and the number of college students over the age of 24 has nearly doubled since the 1970s. The nation's military academies have seen a similar shift - a growing number of older cadets alongside those who are fresh out of high school. Elissa Nadworny from NPR's Ed team visited the U.S. Air Force Academy near Colorado Springs, and there, she spoke with older cadets about the challenges they faced competing physically and academically with teenage classmates. ELISSA NADWORNY, BYLINE: They call them priors because they've had prior experience before enrolling here. Most have enlisted or deployed. Some have worked or traveled. And the number of priors on campus is rising. This year, it's about 1 in 10. BRIAN R KELLY: I'm Cadet First Class Brian R. Kelly. NADWORNY: At 26, Brian is the oldest cadet at the academy. He's tall and muscular in fatigues and a black beret, watching the freshmen complete a summer rite of passage, the assault course. KELLY: Let's go, Overby. Don't give up. KELLY: If I do not see your face in the dirt and you touch my barb wire again, I will send you back. NADWORNY: ...Running through mud pits and doing hundreds of pushups. NADWORNY: When Kelly did this course as a basic cadet, he was five years older than his classmates. KELLY: Two days into basic training here, I wanted to leave. NADWORNY: Kelly had enlisted in the Air Force after high school, so when he came to the academy at 23, he'd already done basic training. KELLY: A freshman who's fresh out of high school, has never been away from home is different from a freshman that's 26 or 35 or however old they may be. They're in a different place in life. NADWORNY: On active duty in the Air Force, he'd worked as an air traffic controller, one of the most challenging jobs. He recalls commiserating with other priors that first year. KELLY: What are we doing here right now? We're all 22, 23, you know, had a car, had a house, you know, had a dog, and now we're here. NADWORNY: Here, where there are rules and rules and more rules and early wake-ups and lots of crawling through the mud with someone yelling at you. MONICA CALLAN: Let's go, Charlie Flight. Hurry up. NADWORNY: Monica Callan is another prior in her senior year. She's the captain of a group of about 30 new cadets. CALLAN: Lock it up, all right - no talking. NADWORNY: She remembers what it was like to be a new cadet. She'd had previous military experience as an enlisted pharmacy technician, and that put her leaps ahead of her 18-year-old counterparts. CALLAN: OK, I have this experience. I know how to do this. So I need to help them out. NADWORNY: She quickly became a model for her squadron. Leading was natural for her. She grew up in the Bronx, the oldest of six kids. She was only 22, but she knew how to lace up her boots the right way, to address her superiors, to hustle. The nicknames followed - Mama Callan or, my favorite, Momica. The hard part for her was in the fall when the academics started. CALLAN: Wow. I don't remember what valence electrons are. NADWORNY: For many of the priors, it's been years since they took a math or science class. CALLAN: A lot of my classmates who were four or five years younger than me were helping me out in classes because that stuff was fresh in their mind, whereas I was just proud that I could remember just little bits of information. ALEX WILLIAMS: Once the school year hit - definitely switched around, where they were the ones motivating me to (laughter) get through class. NADWORNY: Prior Alex Williams was rusty on his calculus, but jumping out of an airplane from more than 10,000 feet - no big deal. WILLIAMS: So if you guys keep that form when you guys exit the plane, it's going to be awesome. It's going to be money the whole time. NADWORNY: I find Williams at the airfield. 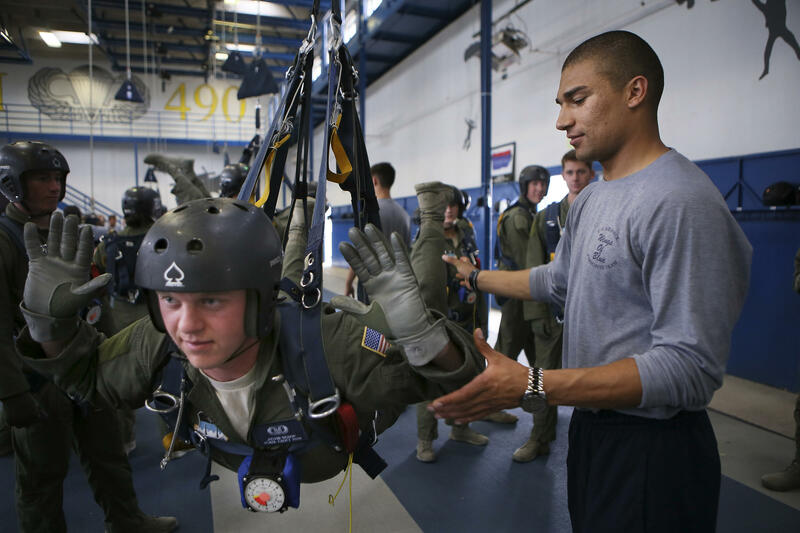 He's helping teach cadets to skydive using a harness dangling from the ceiling. It's an activity he knows well. He'll complete his 537th jump next week. WILLIAMS: All right. We'll get you strapped in here. There it is. And you're flying. NADWORNY: Williams enlisted in the Air Force right after high school, and he served in the honor guard in Washington, D.C. That meant funerals in Arlington Cemetery and foreign visits at the White House and the Pentagon. WILLIAMS: It was definitely great that I had an experience before I came here. I think that gave me a different perspective on the place, helped me stay motivated when things got hard. NADWORNY: And three years later, he's on track to graduate with his bachelor's, and he'll be a lieutenant in the Air Force. Williams gives a lot of credit to his posse of priors. Just last week, he gave a tutorial to a bunch of new cadets. He noticed a few of them had been prior enlisted. So what did he do? WILLIAMS: Grabbed them by the chest strap and told them not to quit (laughter). NADWORNY: Elissa Nadworny, NPR News, at the U.S. Air Force Academy near Colorado Springs. UNIDENTIFIED MAN: The coffee's mighty fine. UNIDENTIFIED CROWD: ...The coffee's mighty fine. UNIDENTIFIED MAN: It looks like muddy water. UNIDENTIFIED CROWD: It looks like muddy water. SHAPIRO: This story was a collaboration with the education reporting project The Hechinger Report. UNIDENTIFIED MAN: Oh, Lord, I want to go. UNIDENTIFIED CROWD: Oh, Lord, I want to go. UNIDENTIFIED MAN: But they won't let me go. Transcript provided by NPR, Copyright NPR.